It was a very cold day today. 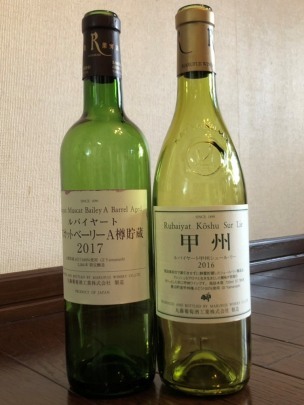 It was a really clean & fresh Koshu wine. The taste was very elegant. I think this one is a very good sample for every Koshu wine. I kept talking the same comment since 15 years ago. It was a truly fine wine. I was gifted this red wine from Mr. Omura, who is the owner & winemaker, by hand to hand in this month. Marufuji Winery is one of the best red wine producers in Japan. This Bailey-A is a very fine red wine, too. It has very dense fruits, mild tannin and very long after taste. I think it is a very special Beiley-A.